There are 77 million under-insulated homes in the U.S. With more and more Millennials turning towards home purchasing, and Baby Boomers downsizing for retirement, there's more demand than ever for insulation service. The insulation industry is a 7.5 billion dollar market in the U.S. that’s poised to grow over 6% year over year, hitting 10.3 billion by the year 2019. Most of this growth is being driven by the residential housing market as Baby Boomers downsize and Millennials begin purchasing their first homes, many of which are under-insulated and will need to be brought up to code. This kind of strong, predicted growth – along with the overall growth of the home services industry – provides a business opportunity that’s ripe for expansion. Investors looking for reliable and steady business growth over the long-term will find a simple, sustainable business model in the insulation industry. 7.5 Billion Dollar Market in the U.S. According to a Harvard energy consumption study, approximately 65% of homes in America are under-insulated. This translates into about 77 million homes across the country that actively need insulation. Many of these homes were built prior to 1980, when only a fraction of state building codes required insulation to be installed in homes during their construction. 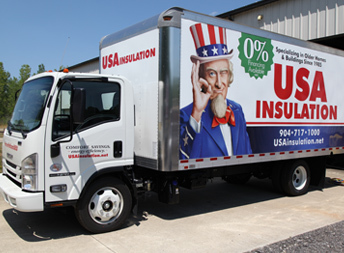 USA Insulation is a leading brand in the insulation industry with little to no competition in communities across the U.S. Unlike other home services and home improvement industries, the insulation market isn’t as saturated as other more competitive businesses like plumbing and HVAC, windows, or moving and storage. There is no strong national chain (besides us) for the residential retrofit insulation market, and the vast majority of competition is made up of local mom n’ pop shops that lack the structure, systems, and processes that a franchise offers. This leaves the insulation market wide open for growth for companies that have the infrastructure and model to move quickly and build a market presence in high-growth areas. Superior Expertise - USA Insulation has over three decades of experience and expertise in the insulation industry. We understand the market and our customer's needs. Superior Products - Our high-value proprietary premium foam insulation product provides more energy efficiency for customers and gives us a leg up on the competition. National Brand Positioning - Build your business with the backing of a strong and recognizable national brand that customers know and trust. Buying Power Advantages - Take advantage of the resources that come with a national franchise, like established vendor relationships and volume pricing on inventory. Customer Satisfaction - Build upon our already strong customer base of over 80,000 satisfied homeowners, and know that our customer service process will keep more of them coming. USA Insulation’s success rides on its proprietary product, USA Premium Injection Foam. Unlike other insulation, it is injected into the walls from outside the home and hardens to form a solid barrier that keeps the outside air out and the expensive, conditioned air in. Independent tests show it is the most energy-efficient and environmentally-friendly insulation available today. We also offer a full complement of services including Attic Insulation and Air Sealing. Our proven franchise model makes it easier to enter the insulation industry! USA Insulation has a tried and true methodology for succeeding in the insulation business. For over 30 years, we’ve tested our business model to ensure that our franchise owners have a solid plan to follow to build profitable businesses of their own. Compete the short form below or call us today at 440-306-5862 to find out what growth opportunities are available in your community.